It has been a while since I did a cooking post. The last few weeks have been crazy at Duke’s House and we are doing well to feed ourselves, let alone try cooking new things. I think our crazy schedule is about to settle down some, so I expect to be back in the cooking game! As I have mentioned before, Chris loves Mexican food, so when I saw this recipe on Branny’s website I couldn’t wait to try it out. I knew that it would be tasty and healthy and it did not disappoint. He finally made his way into the kitchen to see what I meant. He had been envisioning gooey, cheese filled, enchilada bliss. What he saw, was a skillet full of squash. Of course I know that, but what fun would that be? The verdict, these were great. I will consider doubling or tripling the recipe for the green sauce next time. I will also consider incorporating queso fresco. *I will consider doubling or tripling this recipe next time. We like sauce a lot. Place tomatillos and garlic in a pan for roasting, and spritz with olive oil spray. Cook 35-40 minutes, turned once or twice, until the vegetables soften. Dice peppers, onion, zucchini, and squash. Saute vegetables over a medium heat in a pan sprayed with olive oil for several minutes, until the veggies soften. Season with all chili powder, cumin, oregano, and lemon juice. Add black beans and cook 3-4 minutes longer. For the green sauce, combine tomatillos, garlic, and cilantro in a food processor. Process for a few seconds and check to see if water is needed. Add water as needed to reach desired consistency and continue processing until desired texture is achieved. Place 1/3 of the sauce in a saucer or shallow. Slightly warm the tortillas by placing them in the oven briefly. After they are warm enough to be pliable, dip the first corn tortilla into the tomatillo sauce so that it is covered on both sides. Fill tortilla with several spoonfuls of the bean mixture. Fold over tightly and place seam side down in a baking pan that has been sprayed with olive oil spray. Repeat as needed until no filling remains. Spread the remaining 2/3 portion of the tomatillo sauce over the enchiladas and bake, covered, at 350 degrees for 30 minutes. Calories ~ Difficult to estimate. 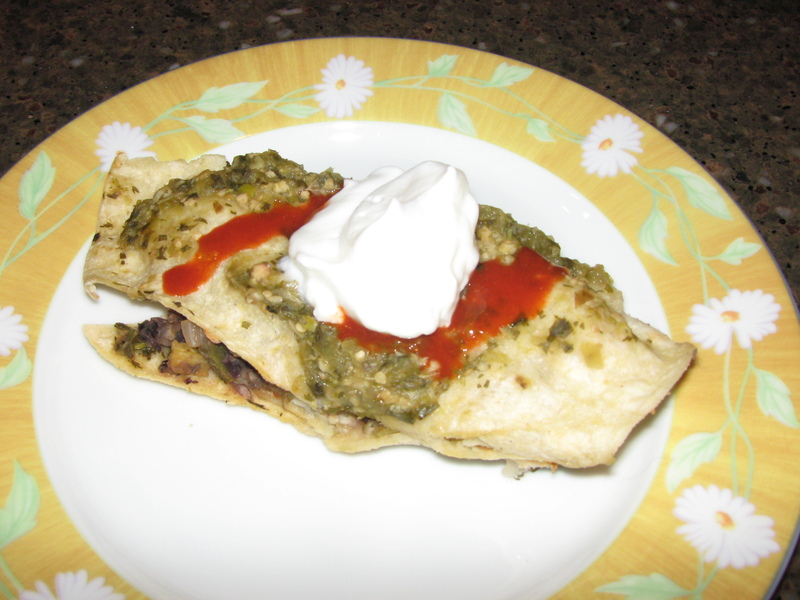 Branny estimated hers at about 94 calories per enchilada. I think 100 calories per enchilada is a fair ballpark figure, but it is hard to calculate because of varying zucchini and squash sizes, different brands of corn tortillas, different amounts of filling, etc. I would eat 2-3 enchiladas plus some sides for a reasonable dinner.